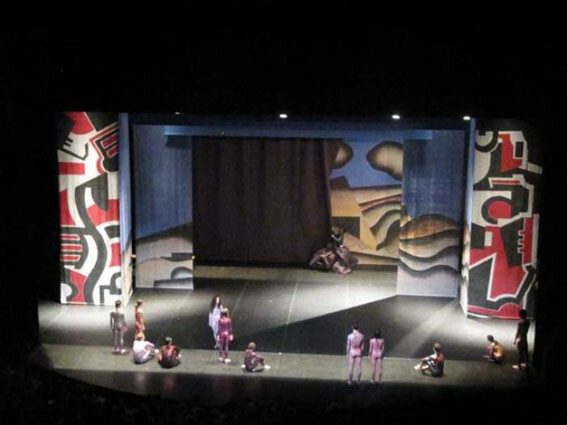 Artistic direction Faustin Linyekula // Music creation Fabrizio Cassol // Scenography Jean-Christophe Lanquetin // Costumes Lamine Badian Kouyaté – Xuly Bët // Lights Virginie Galas // Coordination Production Virginie Dupray // In dialog The Creation of the World 1023 by the Swedish Ballet // Ballet Blaise Cendrars // Music Darius Milhaud // Curtain, set and costumes Fernand Léger // Choreography Jean Börlin // Reconstitution Millicent Hodson & Kenneth Archer // With Bulat Akhmejanov, Jonathan Archambault, Grégory Beaumont, Philipp Berlin, Agnès Boulanger, Petros Chrkhoyan, Justin Cumine, Morgan de Quelen, Fabio Dolce, Phanuel Erdmann, Valérie Ferrando, Baptiste Fisson, Marc Galvez, Irma Hoffren, Tristan Ihne, Laure Lescoffy, Valérie Ly-Cuong, Yohann Rifosta, Sakiko Oïshi, Joris Perez, Marion Rastouil, Elisa Ribbes, Florence Viennot, Marie-Séverine Hurteloup and Djodjo Kazadi. 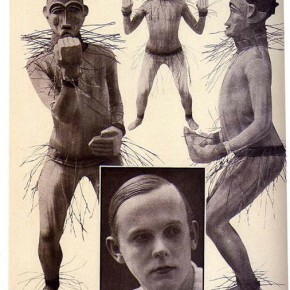 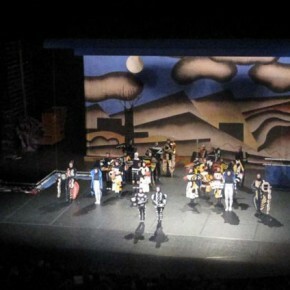 The piece is made of two pieces, intertwined, a reinterpretation of a 1923 piece by Swedish ballet, La création du monde, the first european dance ballet questioning Africa as being the origin of the world (but at the same time full of epochal cliches, including racial), and it’s contemporary lecture by Faustin Linyekula. 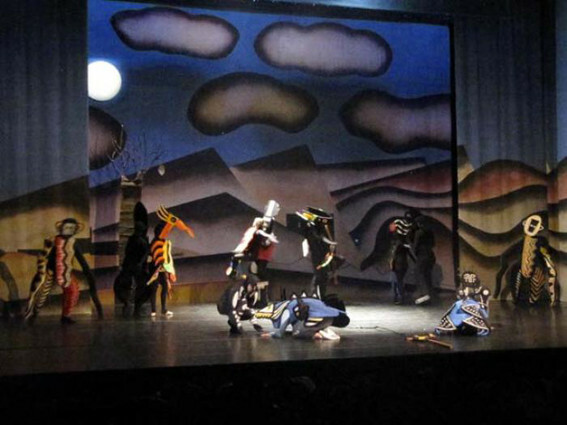 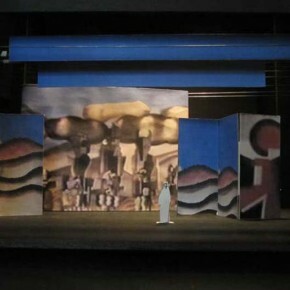 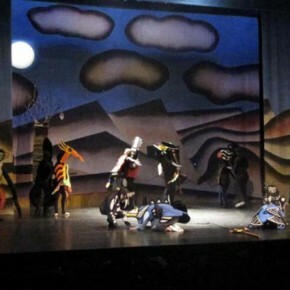 The principle is to intertwin the two pieces, means at a scenographic level, work with reconstitution elements made in 2000 and make them appear on stage during the piece. 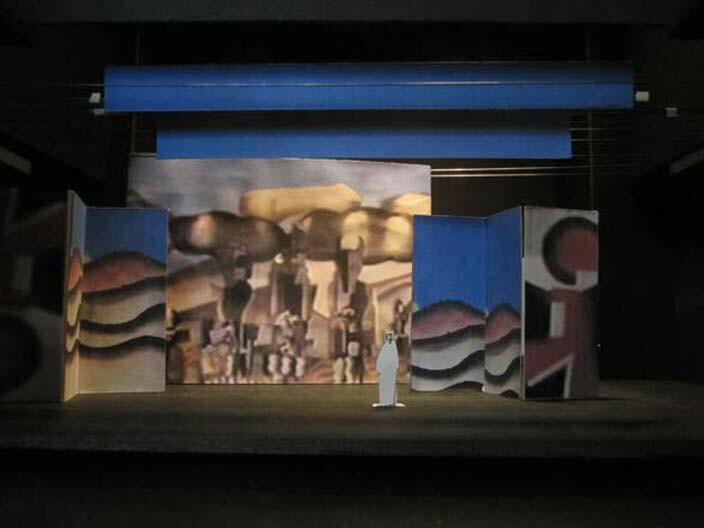 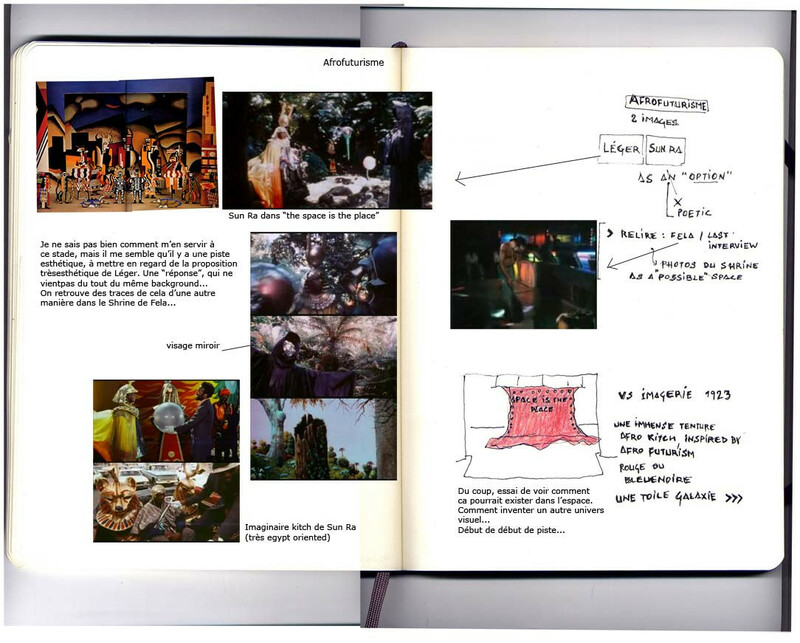 Means also, build a scenography with the reconstitution of another scenography. 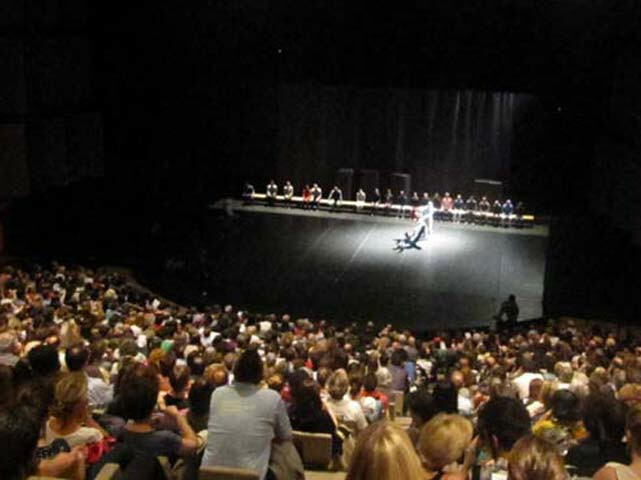 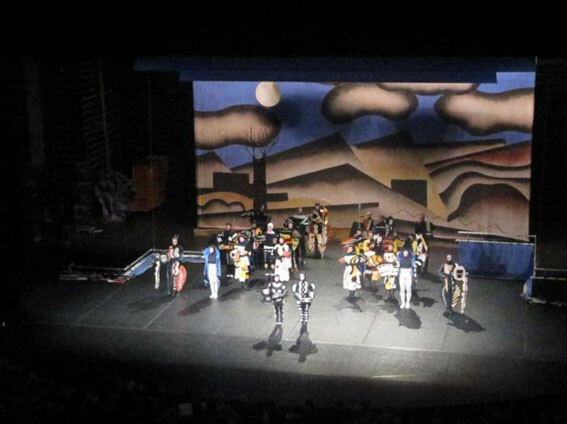 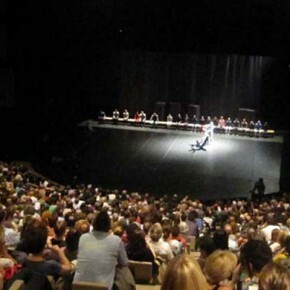 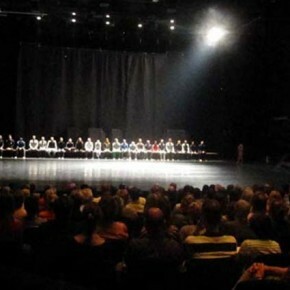 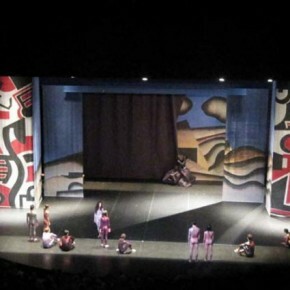 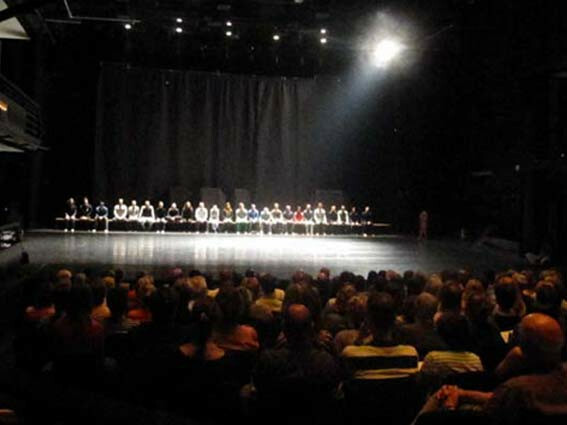 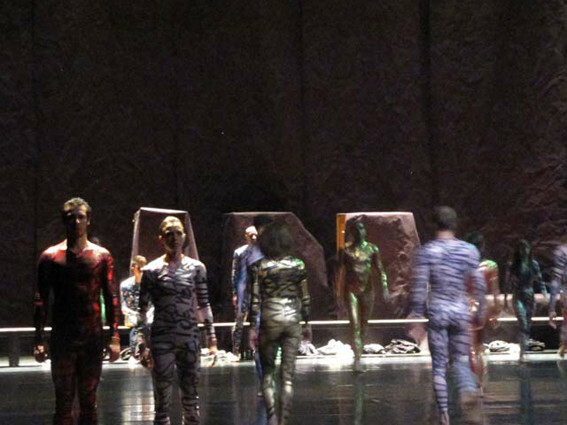 Beginning of the piece: the 26 dancers sitting on a bench are facing the audience (left: Théâtre de la Ville, Paris / right: KVS, Brussels). 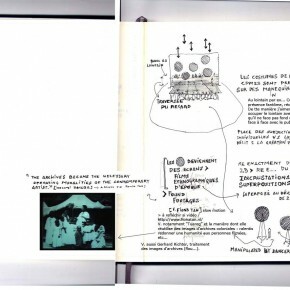 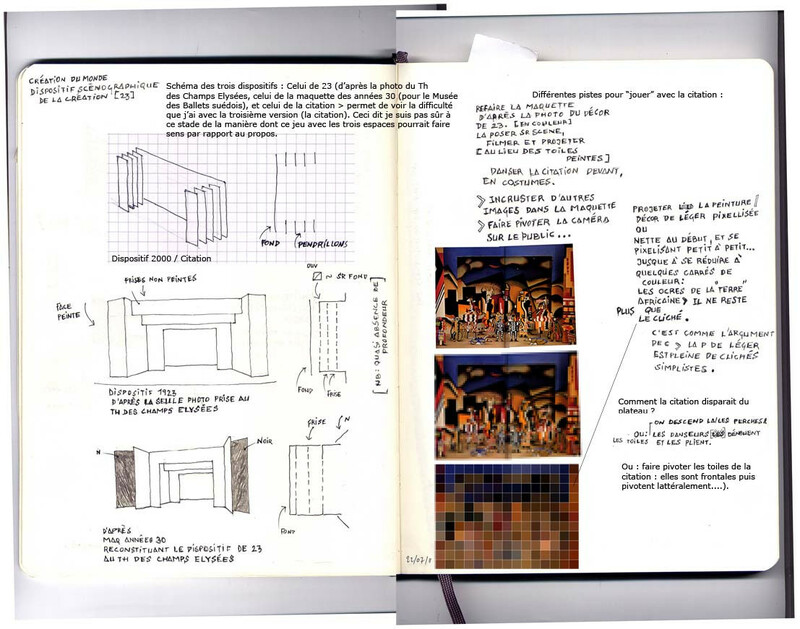 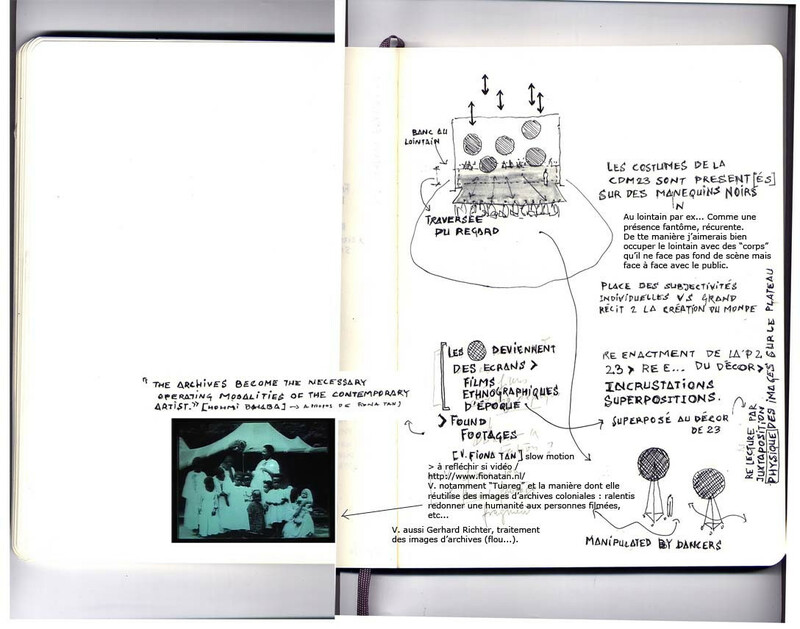 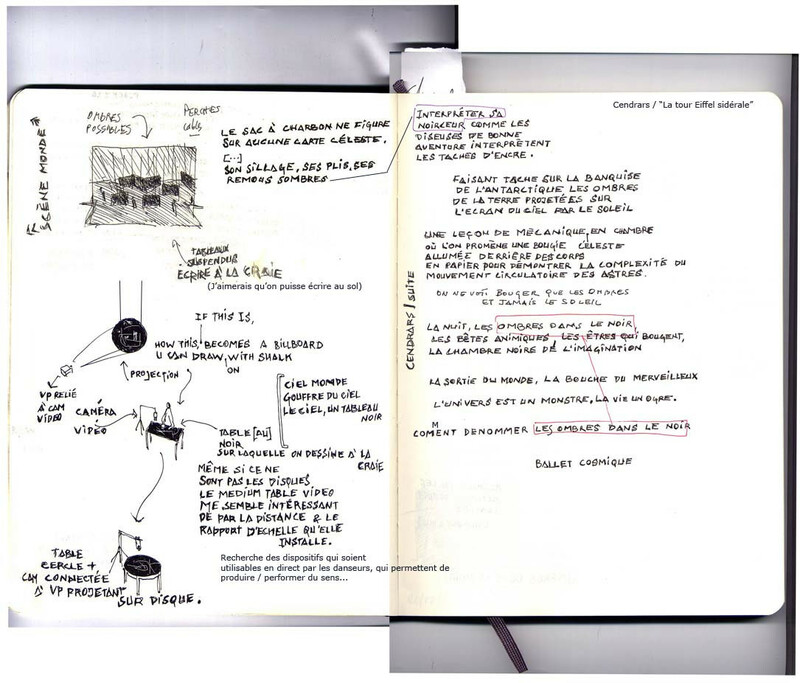 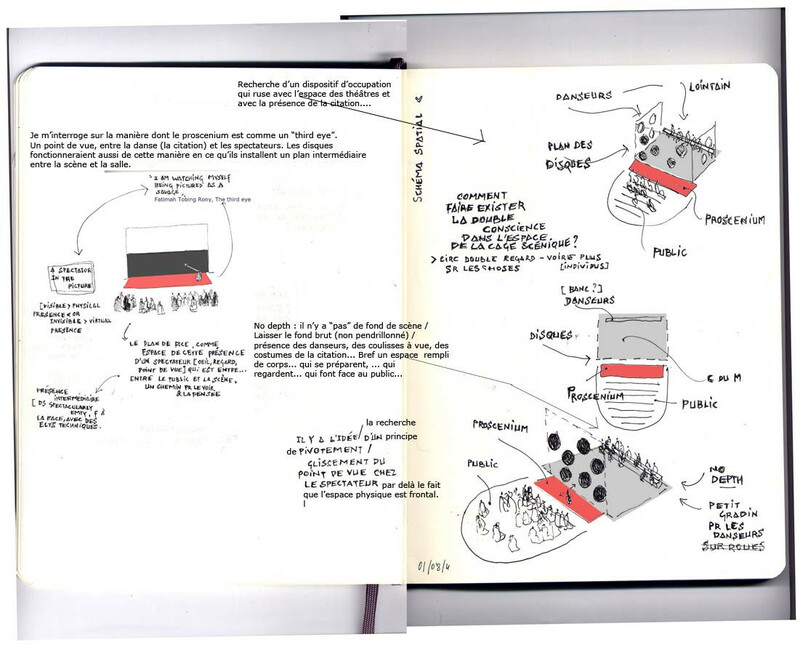 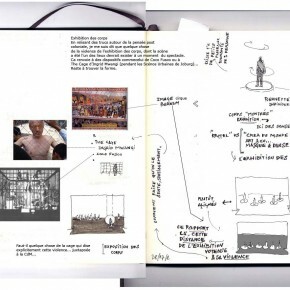 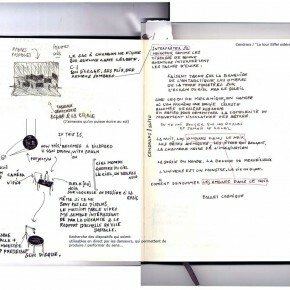 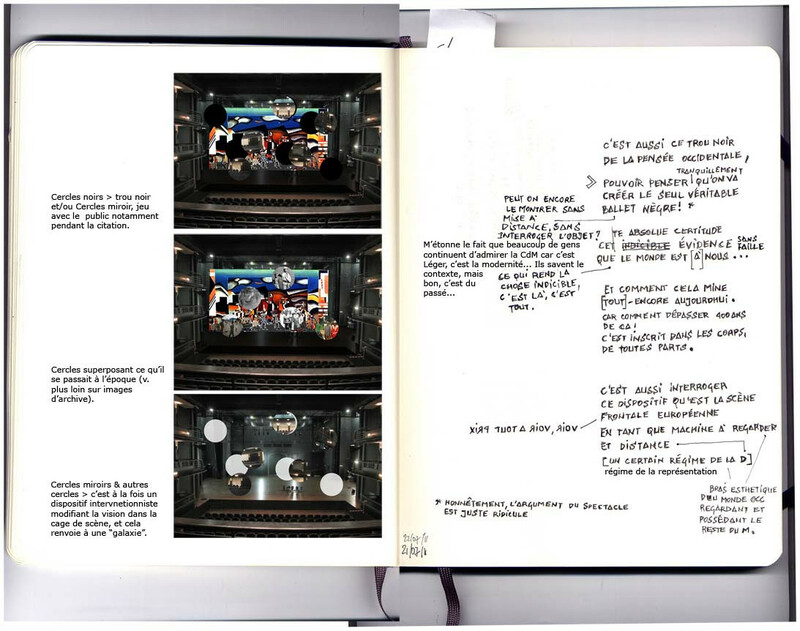 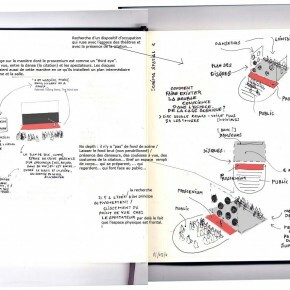 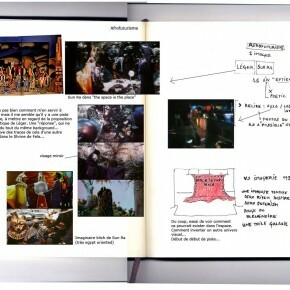 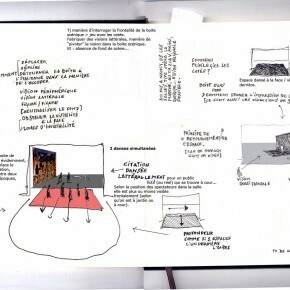 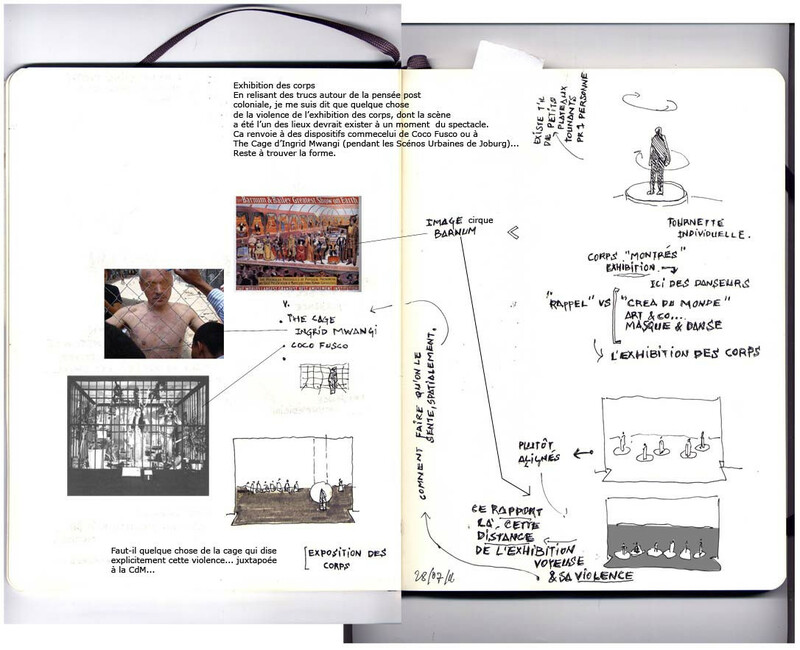 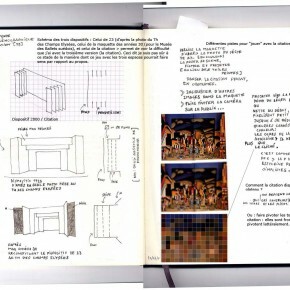 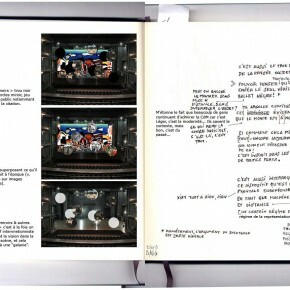 Process: documents include: a scenographic description by Fernand Leger // dances ‘reference’ to Congolese dances by Jean Borlin // a notebook page about the scenographic questions // 3 images of the space including the 1923 set at Theatre des Champs Elysées, the 1935 model and my version in 2012 // 3 steps of the model process, or how to deconstruct spatially and politically the space: on the floor, with a 10° angle, fragmenting the higher part but keeping the spatial continuity at the floor level. 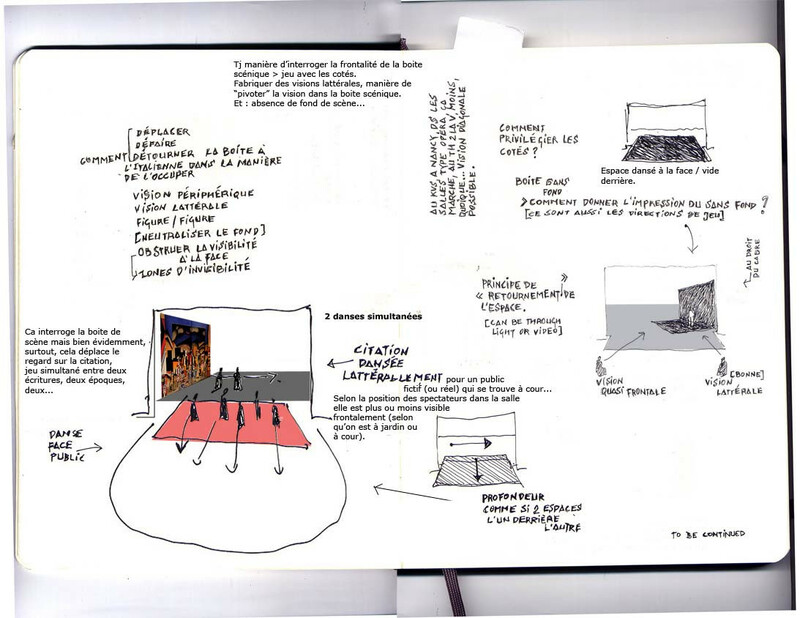 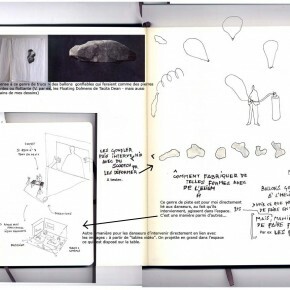 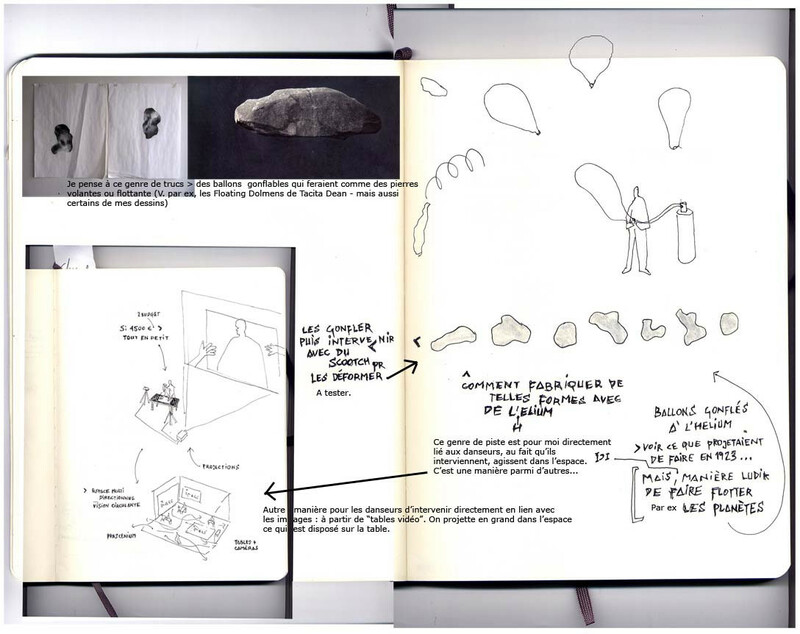 In this project the process is as interesting as the final scenography. 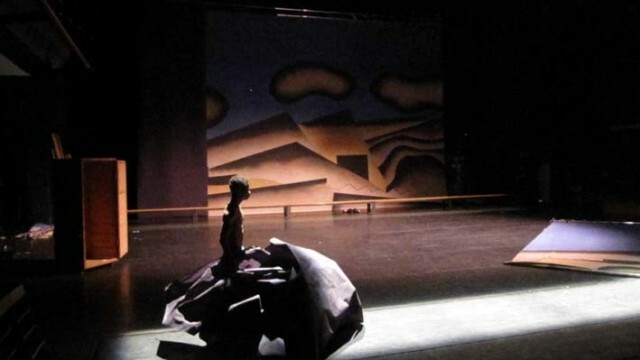 What was impossible to do is really meaningfull. 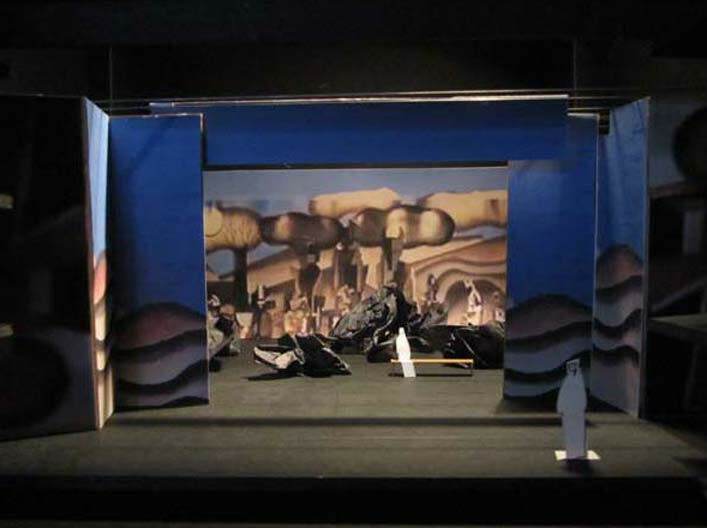 The major difficulty was to deal with a ‘classical’ reconstitution made in 2000 (with the idea to recreate), but which was a real misinterpretation at a spatial level, of the original piece. 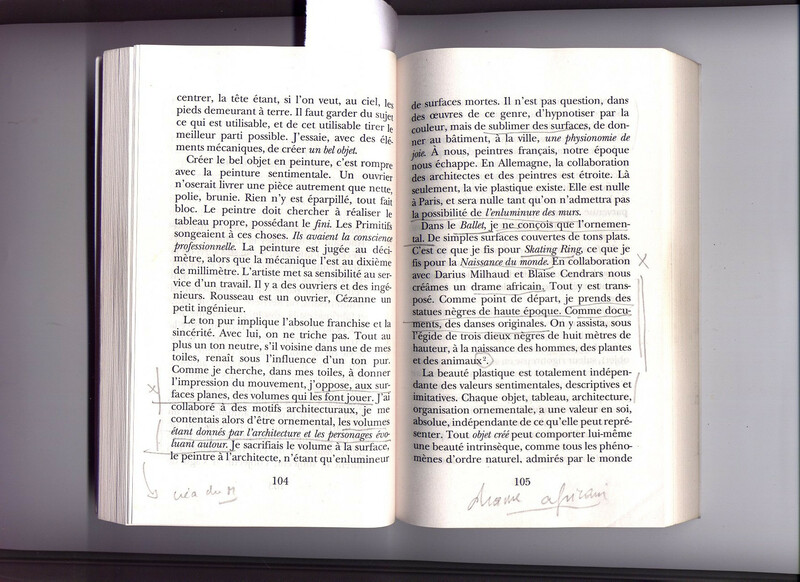 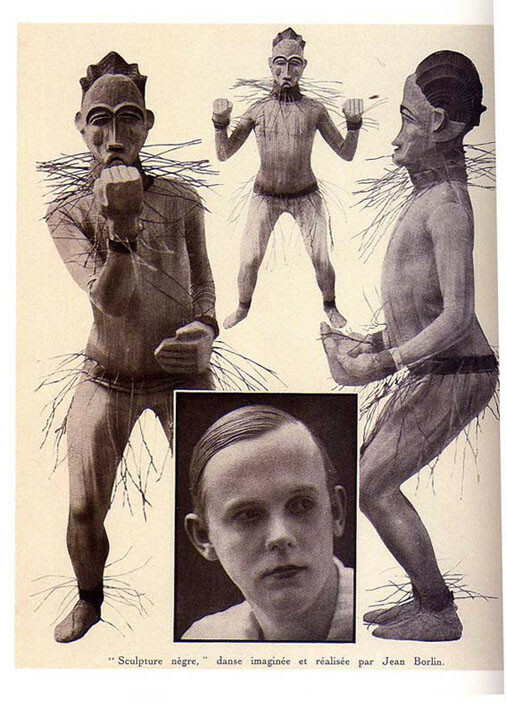 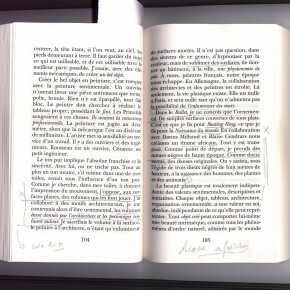 I had to respect this version (in terms of contract), which was hindering our options to question the 1923 piece (Faustin’s original idea) and in a larger way what is an archive. 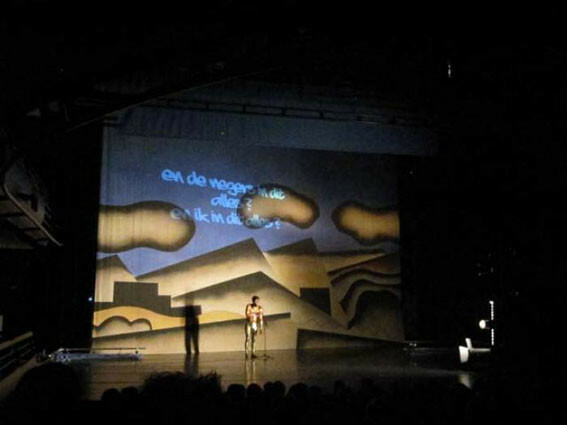 At a spatial level, I explored two directions: the first one was to recreate the absence of depth which is Leger’s spatial concept (an animated bas relief) but was totally absent of the 2000 version (this can be understood as there was very little space for dance, but why doing such a reconstitution so, if it’s not to respect the original spatial concept?). 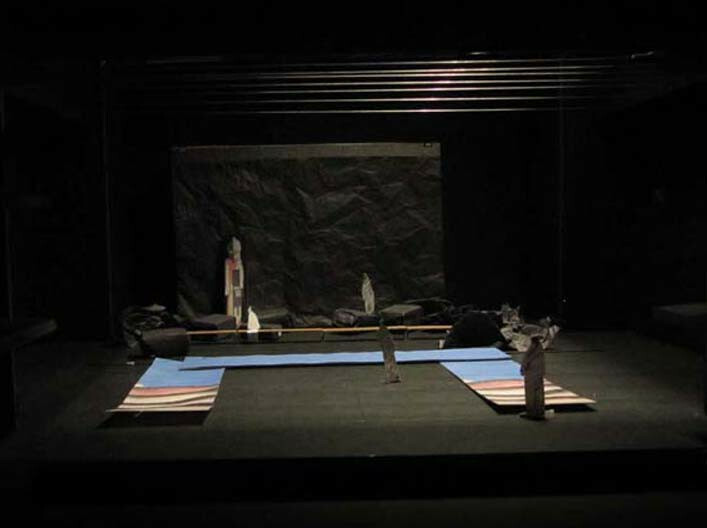 The second direction was to ‘perform’ the 2000 version rags (oripeaux), by experimenting various ways to install them on stage (with a 10 degrees angle, on the floor, with a spatial coherence at the floor level but fragmented at the higher level, etc.). 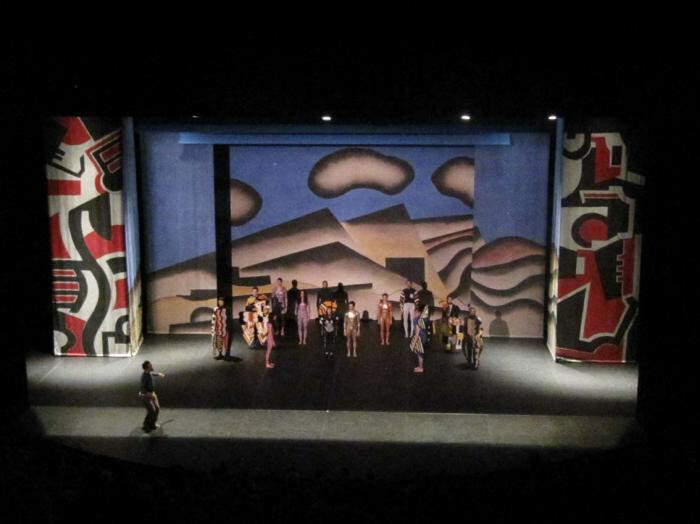 None of these options was finally possible but in the final version these experimentation appear during the ongoing construction process simultaneously with the dance, in the way Djodjo Kazadi unpack the back painting from it’s black paper, and in this crucial moment of the piece, just before the reconstitution begins, when all the dancers appear in a reconstitution of the 1923 picture position as the backpainting move forward: for a few seconds we can see the bas relief, then the stage curtain clothes and when it reopens, we see the 2000 version of the performance. 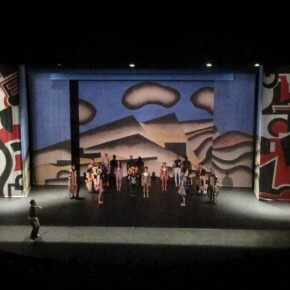 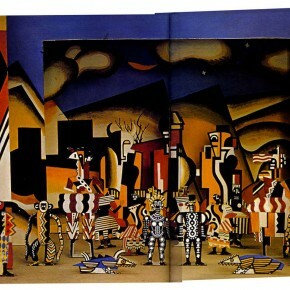 Another interesting moment is the end of reconstitution when all the dancers come to salute: the audience claps, and there is a strange moment of uncertainty before Djodjo Kazadi appears, the rags fall, and the main painting turns 30°. 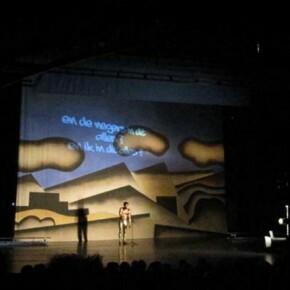 Djodjo ends the performance with a very political speech about being a man in such a colonial past. 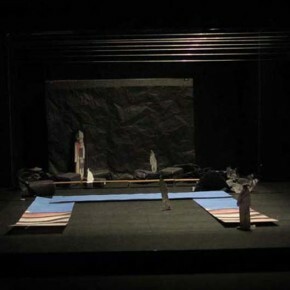 This project was an opportunity to explore various ways to deconstruct the frontality of the classical stage and image but from inside. 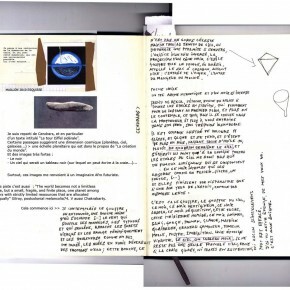 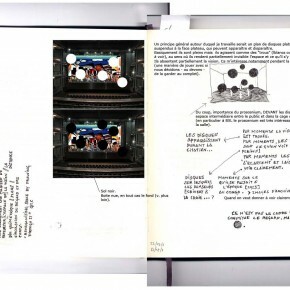 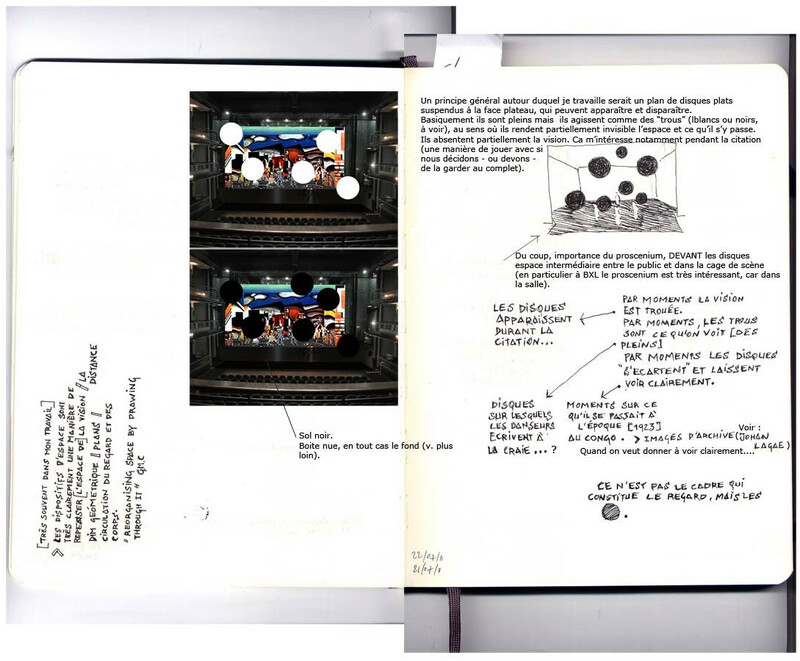 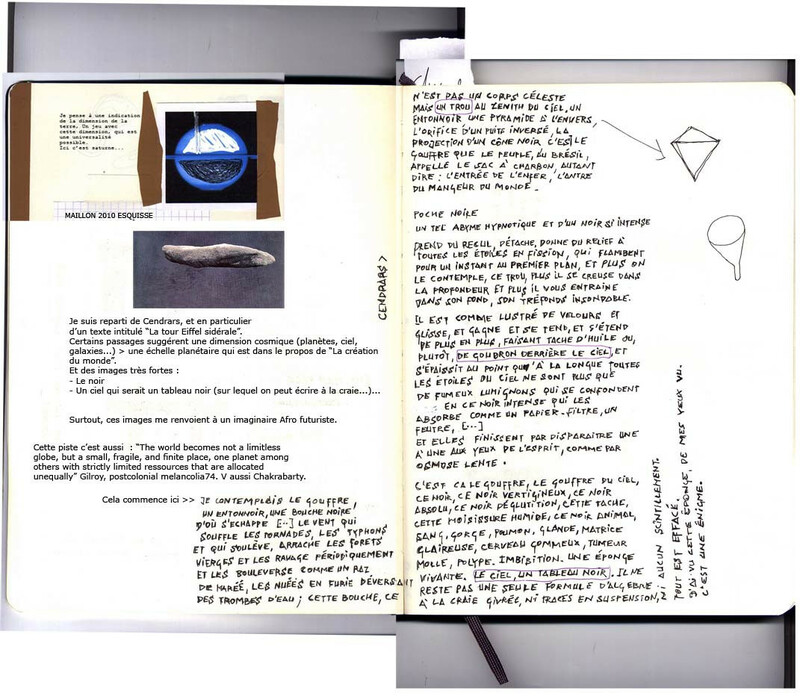 In the folowing notebook there is, among others, a deconstruction of the idea of a decor inspired by found footage principles: in front of the coherent and powerfull image (tableau) built by Léger I make appear circular holes which are coming to tear it. 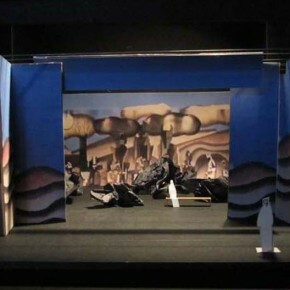 One version is with mirrors, means the audience space reflects itself in the tableau.